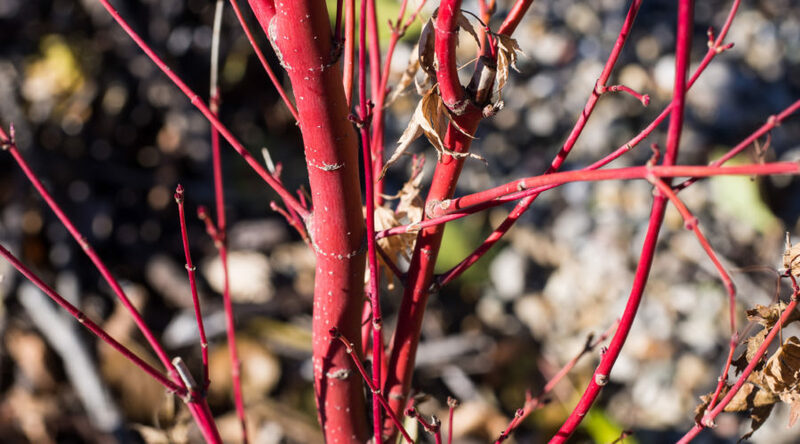 What makes this Acer notable are its coral-colored stems that brighten the darker winter months. This deciduous tree is stunning when paired with winter-blooming, red-blossomed camellias. Slow-growing to 20 feet. 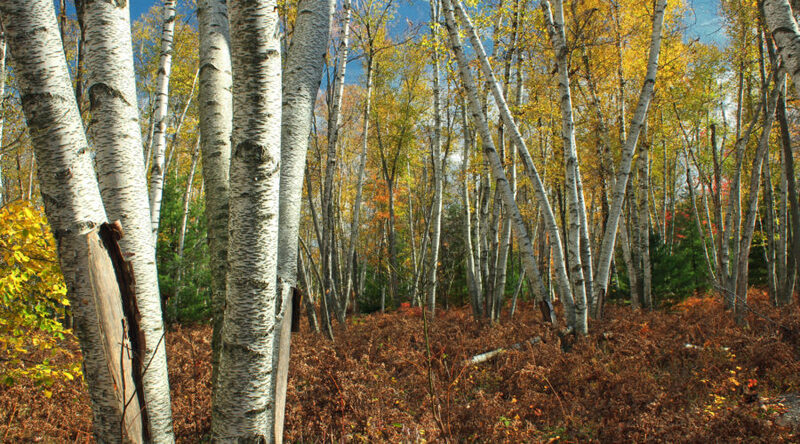 Birches are distinguished by their gleaming white bark resembling paper shavings (hence the name), followed by an orange-brown interior. This low-maintenance tree thrives in cool climates with consistently moist soil and is especially stunning against stark winter backgrounds. Golden fall color is also a bonus. Grows quickly to 50 to 70 feet tall. This handsome rounded evergreen tree is popular for its peeling reddish bark that adds a colorful and textural element to the garden. It’s also loved for its charming urn-shaped, pink flowers that dangle like earrings and strawberry-like fruits that appear in the fall. Grows to 30 feet tall and wide and likes full sun. 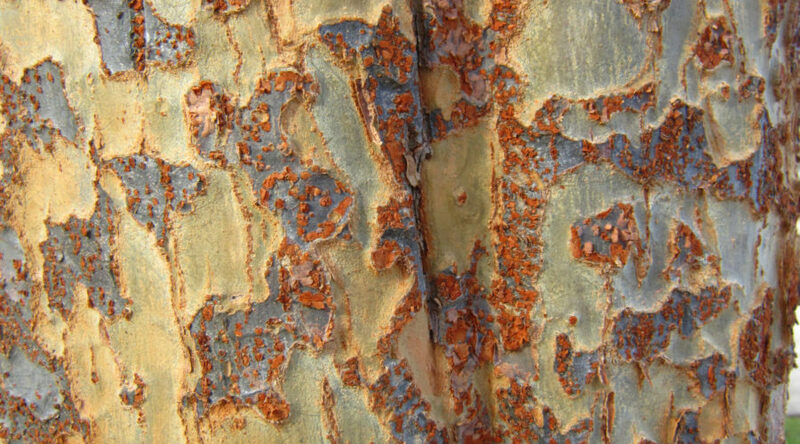 You can’t miss this standout tree with its trademark peeling bark in colors ranging from cinnamon stick to coppery orange. 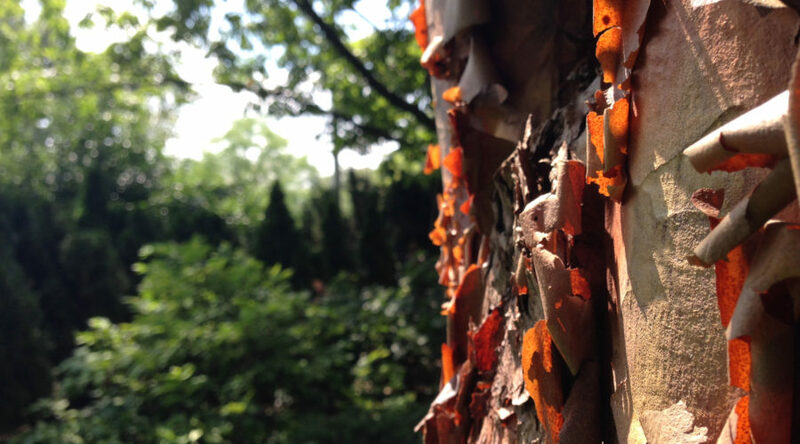 Instead of falling off, the papery peel clings to the tree in a complementary color patchwork. 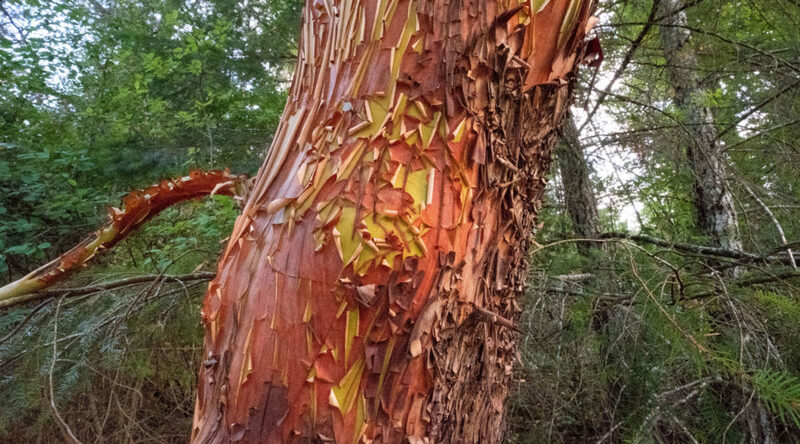 Paperbark is deciduous, grows slowly to 25 feet tall, and takes part to full sun. 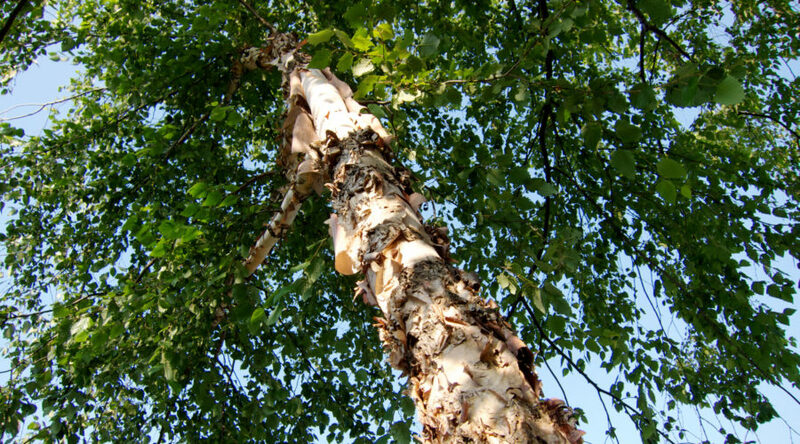 Bark layers colored in salmon-pink to gray tones exfoliate on the river birch to reveal a lighter inner bark. This attractive and hardy tree grows quickly in medium to wet soils in full sun to part shade. ‘Heritage’ is a popular variety for its superior ornamental features. 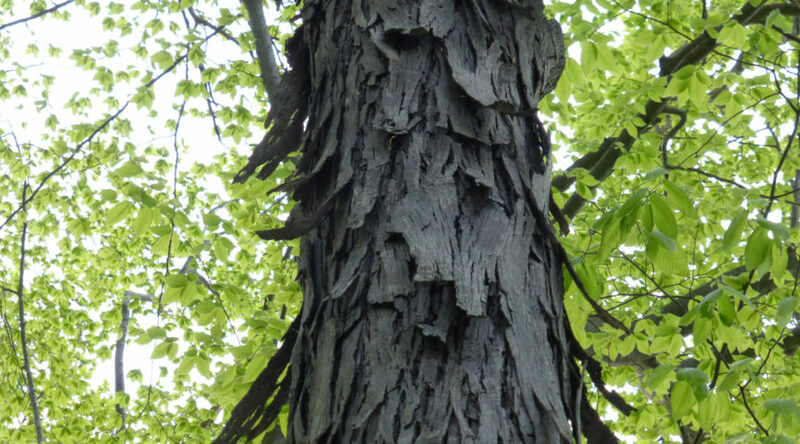 This gigantic lesser-known tree starts with smooth, dark gray bark when young, but as the tree matures the brittle bark begins peeling off in long curling strips. Grows from 70 to 90 feet in rich soil and can live for more than 350 years. Identifiable by its bark’s patchy complexion suggesting camouflage--a mixture of cream, tan, and greens--that sloughs off in plates. Wide maple-like leaves adorn this massive deciduous tree growing 75-100 feet. 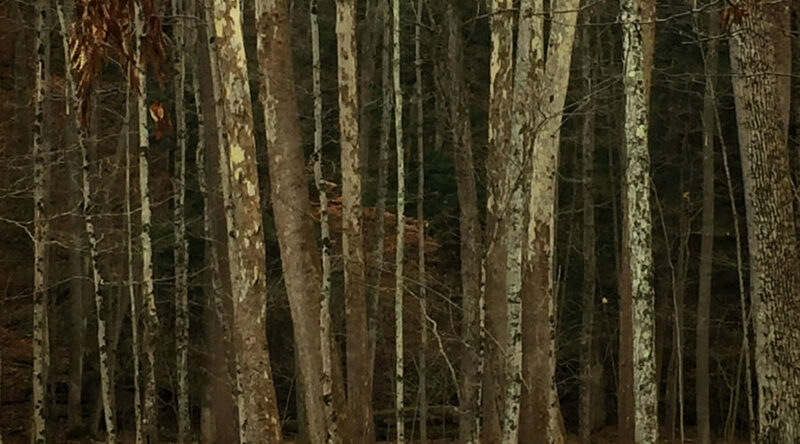 As this smaller tree ages, its bark flakes off like patchy dry skin, uncovering a smooth palette of autumnal yellow, brown, green, and gray tones that resembles a paint-by-numbers picture. In the fall, it has stunning red and yellow leaves; springtime brings fragrant pink flowers followed by mighty citron yellow fruits. This tree is a true all-season winner. Flaking outer bark reveals a glorious puzzle pattern mix of brown, copper, and gray. This graceful tree has a rounded crown adorned with leaves that burst into color in autumn. 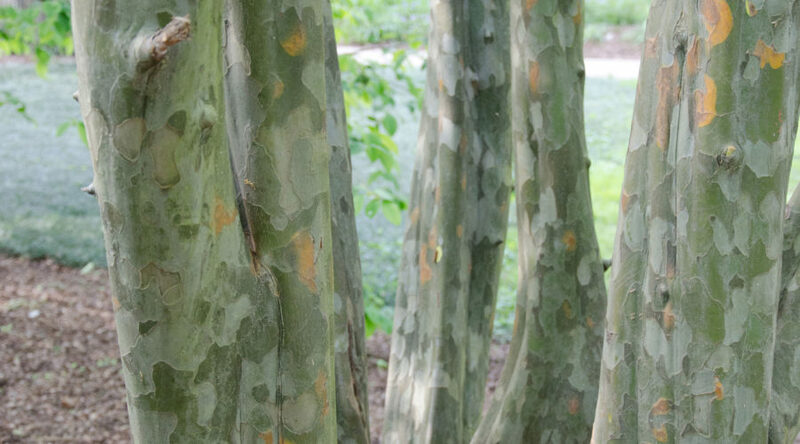 Growing to 50 feet, this tree accepts most soils and is a tough and durable choice. While not exactly growing to mammoth tree height, this spectacular evergreen can be trained into a small multi-branched specimen. 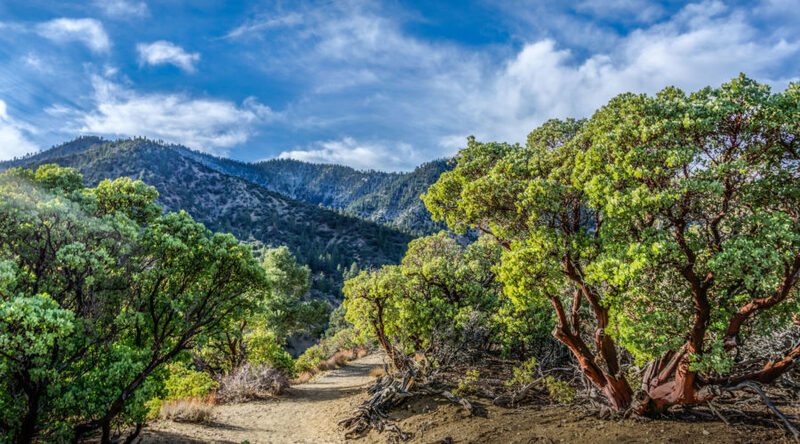 This California native features thin bark that buckles, splits, rolls up into ribbons, and then sheds away in early summer to reveal new smooth bark darkening into varying rich mahogany shades. Fairly fast to 15 feet, full sun and low water.